To reveal the secret workings of a plant’s threat communication system for a study published Thursday in Science, Masatsugu Toyota(now a professor at Saitama University in Japan) and other researchers in Dr. Gilroy’s lab sent in munching caterpillars like in the video above. They also slashed leaves with scissors. They applied glutamate, an important neurotransmitter that helps neurons communicate in animals. 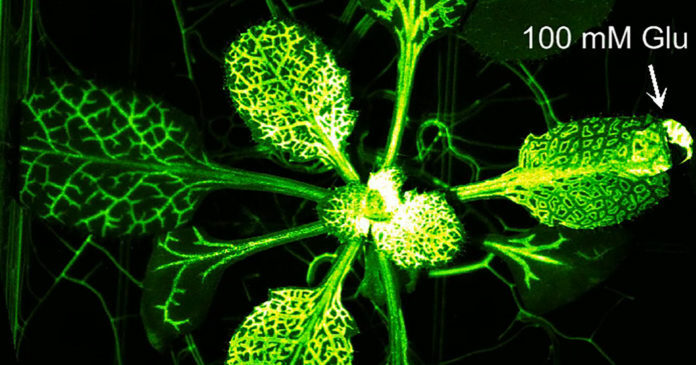 In these and about a dozen other videos, they used a glowing, green protein to trace calcium and accompanying chemical and electrical messages in the plant. And they watched beneath a microscope as warnings transited through the leafy green appendages, revealing that plants aren’t as passive as they seem.